Christine McNair is a one-woman fireworks spectacle. In her debut poetry publication CONFLICT she hits just about every target of creativity in writing in the poetic forum (and even tosses in some ‘short stories’ to boot). Words, for McNair are a means to an end, and she scrambles them, places them all over the place in some poems, combines them in ways that at first glance make us wonder about the meaning only to come back later and, red-faced, say ‘Ohhhhh….’ And yet this sorceress of language can settle into some poems that are about as sensitive and tender as any we can find. Christine McNair drives a rollercoaster of words and ideas and feelings and off the wall ideas that provide the reader with a challenging but thoroughly satisfying experience. She’s new, in more ways than one. 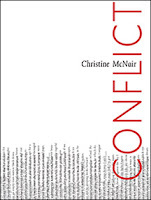 This entry was posted in Book Reviews, Grady Harp, Poetry and tagged 9781927040058, christine mc nair, conflict by Literary Aficionado. Bookmark the permalink.